Seems like the baby already is taking after her mommy’s bad habits. They say you have to watch what you say and do in front of kids because they mimic everything. Well, I didn’t figure we would have to worry about it so soon. Apparently, our little one is already mimicking her mommy from the womb. The mommy-to-be has always thought it was funny to flip off our animals when they didn’t behave or gave her dirty looks. She would always do this and laugh. So after we found out we were pregnant, I started joking that she needs to watch out or our little one would come out of the womb flipping us off. Little did I know how true that would be until we had our 3D/4D ultrasound appointment. 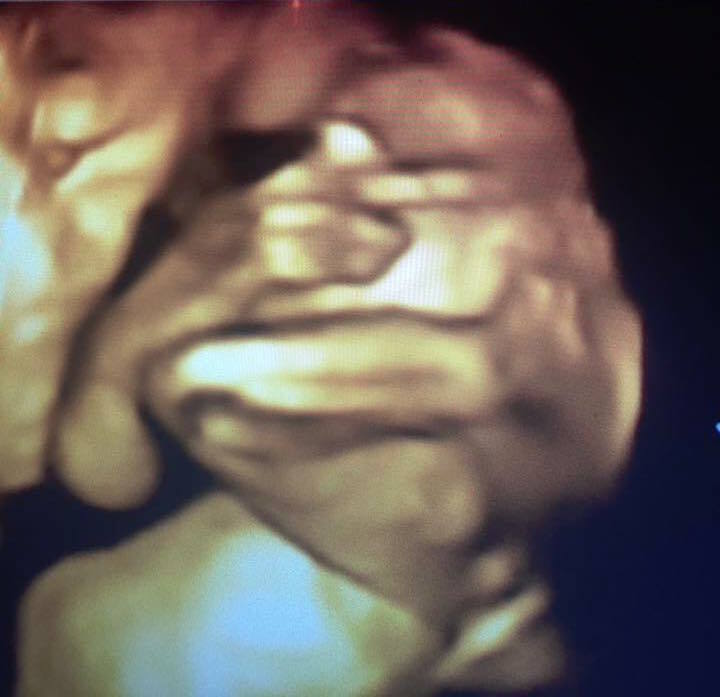 When we started our ultrasound session, our little one had her hands in front of her face. It was so cute because it was like she was shy. Throughout our session, she was also very active and so sometimes it made it hard to get clear pictures. When she did sit still long enough, we got our first glimpse of her features and got to see some cute facial expressions. We also got to see her sticking her tongue out and one special picture of her flipping us off. Yep, that’s right, she takes after her mother already!